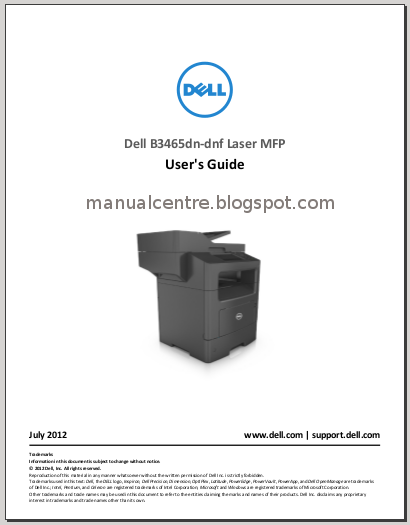 Here we want to share about the Dell B3465dnf Laser MFP Manual and Troubleshooting. The Dell B3465dnf is Multifunction Laser Printer with 50.0 ppm printing speed. It's support for Fax, copier, printer and scanner. It has 7 inches touchscreen display. The printer has physical dimensions of 490.22 x 480.06 x 561.34 mm with weight are 23.58 kg. The connection consist of USB 2.0, USB host, and Gigabit LAN. It's also available 1 GB memory. This printer support for A6, Folio, Latter, A4, A5, legal, Executive, and JIS B5. The Dell B3465dnf Laser MFP User Manual consist of 324 pages with file size of 10.89 MB. The manual available in english and spanish language. In this manual tou can find reference information such as safety, printers configuration, Using the ADF and scanner glass, tutorial Finding the IP address of the computer, Installing the printer software especially for windows and macintosh, Installing a memory card, Installing a printer hard disk, Installing the printer on an Ethernet network, Connecting the printer using the Wireless Setup Wizard, Setting up serial printing, Making copies, Setting up the printer to e-mail, Setting up the printer to fax, Scanning to an FTP address. Then about Configuring printer hard disk encryption, Cleaning the printer, Replacing the toner cartridge, Restoring factory default settings, troubleshooting guide and more.